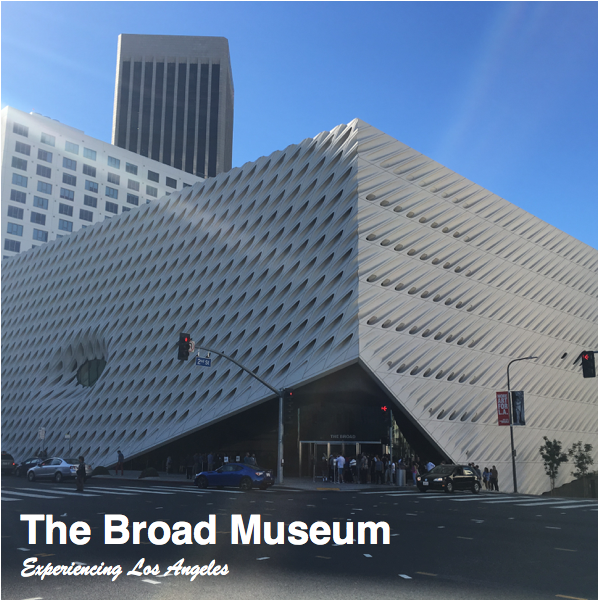 The Broad is a privately owned, contemporary art museum located in downtown Los Angeles. 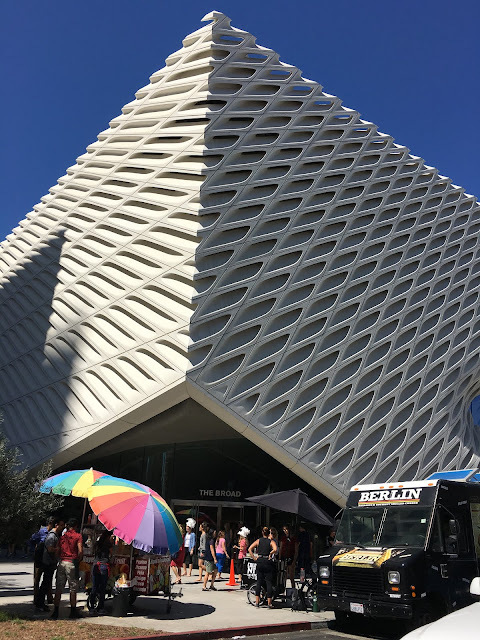 The museum is named after it's benefactors, Eli and Edythe Broad, and opened to the public in 2015. Similar to the Getty Center in Brentwood (and Getty Villa in Pacific Palisades) admission to The Broad (which rhymes with "road") is free. Of course, this being Los Angeles, parking isn't t free. Similar to the Getty, on site parking is $15. Fifteen seems to be the magic number in Los Angeles. But unlike The Getty, it is possible to park on the adjacent streets and walk in. Your best best is Sundays, where not only is there a better chance of finding a spot, but street parking is also free. Walk a couple of blocks and save $15? Sounds good to me. 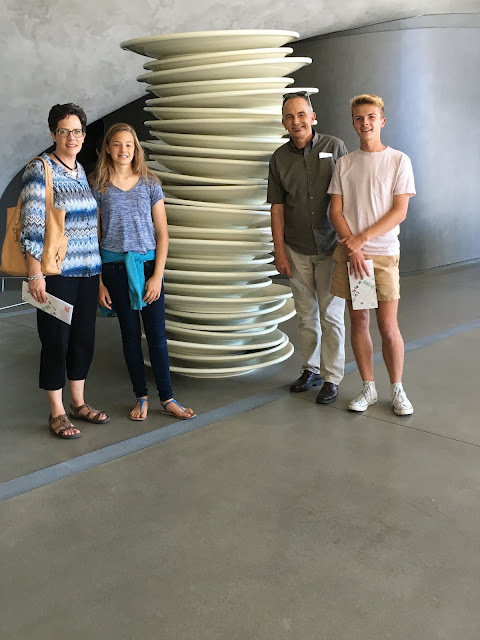 In September 2016, my wife kids and I were in Los Angeles and had time to spend a couple hours at the Broad. 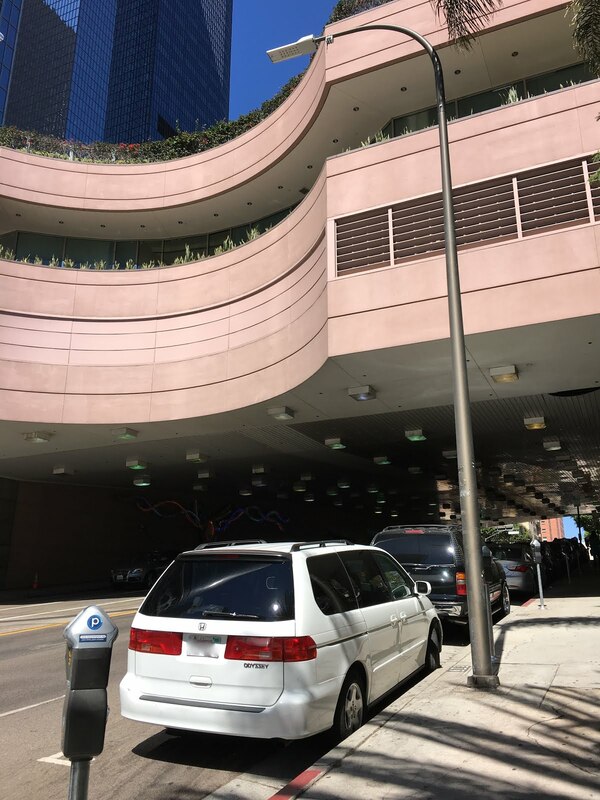 We parked a couple blocks away on Olive Street, just beneath the cantilevered gardens of the California Plaza complex. 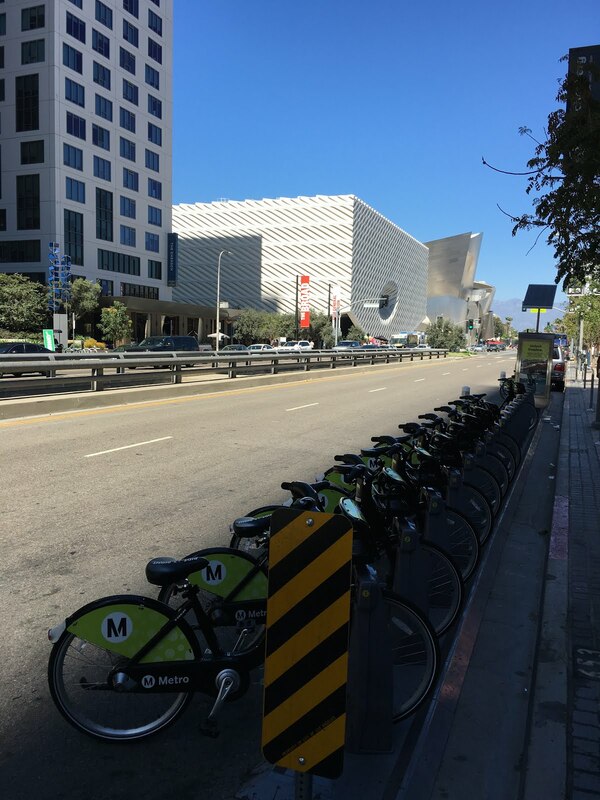 Walking to The Broad, we walked past some of the rental bikes that the city of Los Angeles has installed in various places throughout the region. I'd like to try renting one of these bikes sometime, but that day we had a destination. The Broad is located at 221 S. Grand Avenue. Grand Avenue between 4th Street and General Thaddeus Kosciuszko Way (yes, that's actually a street name) actually has an entire city street below it (used primarily for service and deliveries) appropriately named "Lower Grand Avenue." Here's a link to a previous post with what it looks like, plus some additional photos of the exterior. The unfortunate unintended consequence is that is virtually impossible for street trees of any real size to grown along this stretch of Grand Avenue. None the less, Grand Avenue is getting some grand architecture. The Broad is to the left, beyond is the Frank Gehry designed Walt Disney Concert Hall. Yes, it looks like an air filter. That's part of the design. It's also a very popular location for food trucks. I'm all in favor of food trucks - but they do distract from the design of the building along the street. This is an art museum, which is all about design. If you go, I strongly recommend getting reserved tickets. They're free, and they allow you to walk right in. There is also a standby wait, which can be up to an 90 minutes on weekends. As you enter, you're greeted by artist Robert Therrien's 1993 untitled work, which everyone refers to as "stacked plates" - for obviously reasons. Walk around the stack, the plates really seem to be spinning. 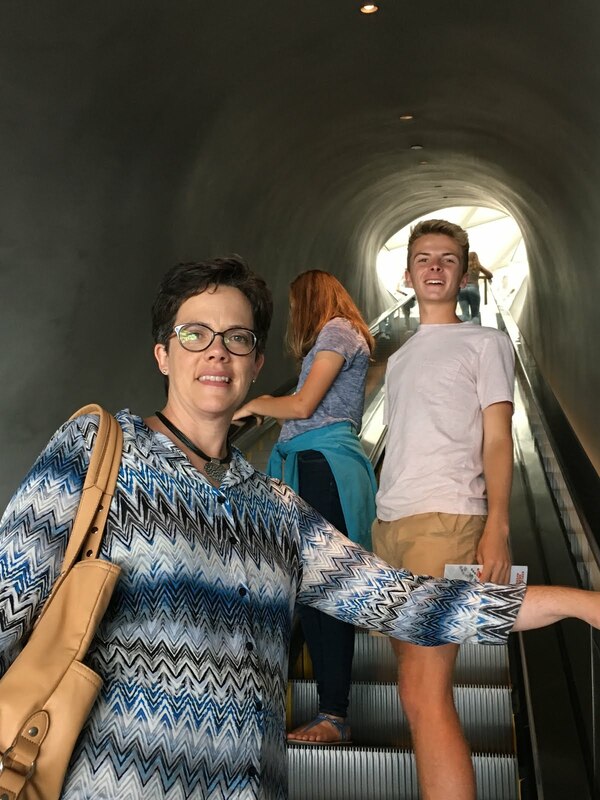 You take the escalator directly up to the third floor gallery. 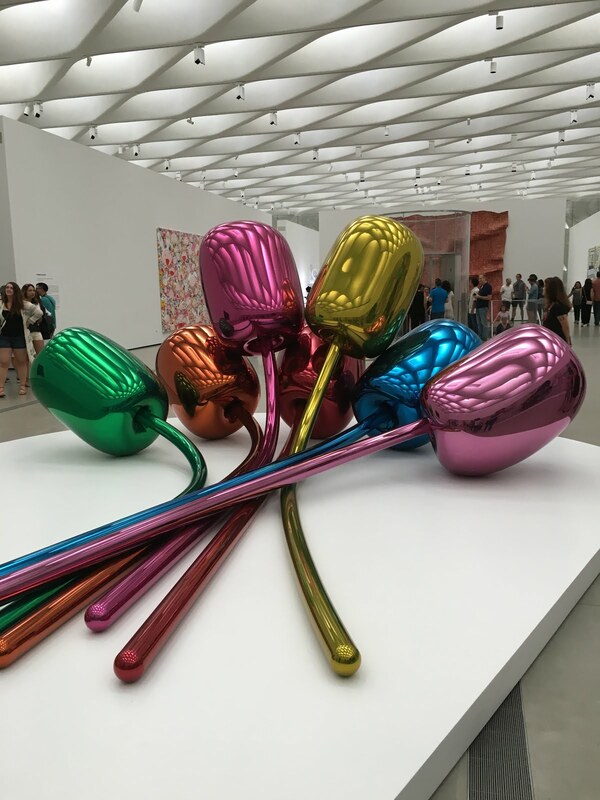 The center of the third floor contains Jeff Koons' massive Tulips sculpture. A similar version recently sold for $33 million. According the The Broad website: "Tulips, 1995–2004, is among the grandest and most technically complex objects ... providing a perfect illusion of balloon flowers, constructed of seamless and mirror-polished stainless steel." Apparently, a similar piece of art was in front of the Los Angeles County Museum of Art - but had to be moved because so many people wanted to touch what looked like an massive inflated balloon. It's art - look, but don't touch. Here's a link to their website. More artwork next week in Part II. 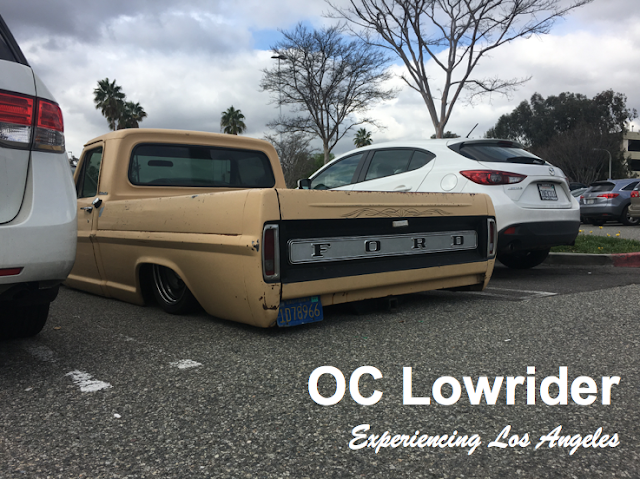 I was in Orange County - just south of Los Angeles - this time last year and came upon this truck. I honestly thought it was missing tires. I've never seen any vehicle this "low." Really, you can drive around town like this? I looks like there's an inch of clearance. Incredible. Wow, impressive. I'm no expert, but based on the body style, maybe 1972? Please leave a comment below. Looks like it's a work in process. The owner has put in a lot of work, so I'm assuming they (he or she) is planning on restoring the bed and repainting it. 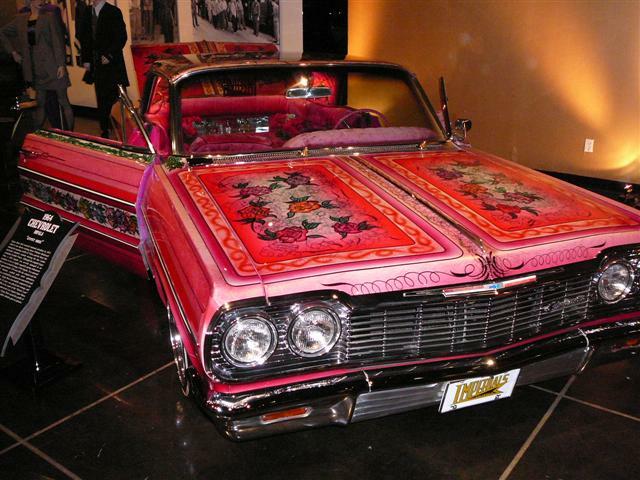 The Peterson Automotive Museum in Los Angeles had an interesting exhibit featuring several historic lowrider cars several years ago. And who can forget the late Huell Howser's visit to the Los Angeles Super Show? It's one thing to see a car like this in a museum or a car show. Another entirely to see it out on the street. Or, in this case, a parking lot. 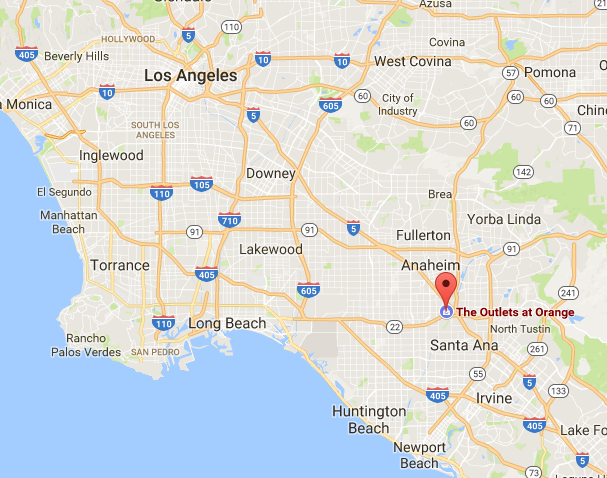 This was at "The Outlets at Orange" - south of L.A. in Orange County.